A pre-curved and anatomically designed glove body is made of high-tenacity genuine DuPont Cordura nylon. This Shelby 2500 glove is Super Armor for the hands that offer extra protection and fit in the field of extreme work. Kevlar reinforced palm & finger reinforcements are at all the high wear stress points. Hidden cord carabineer loop beneath ribbed donning pull. This exceptionally lightweight and durable material is reinforced at all areas. Reflective trim, a brow wipe and elastic snuggle at wrist to repel debris. Shelby 2500 Durable and Lightweight Rescue Gloves offers resistance up to 270°C. This Shelby 2500 glove is Super Armor for the hands that offer extra protection and fit in the field of extreme work. The distinctive Blue leather outer shell is made from Shelby Fire and Heat Resistant material. Thermal Liner includes unique and inherently FR Modacrylic Fleece Laminated to Gore (PTFE) RT7100 Glove Barrier Fabric. This ensures it is waterproof, breathable as well as Flame resistant. Wristlet and Glove Body Thread is sewn with high lock stitch - to ensure a premium quality, long life. These Shelby Firewall 5231 gloves meets the latest NFPA standards - 1971, Standard on Protective Ensemble for Structural Fire Fighting. Outer Shell is made from Shelby Abrasion Resistant, Heavy Weight, Fire and Heat Resistant matereal, Pigskin palm & Gold Koala cowhide back. Thermal Liner includes unique Modacrylic Fleece Laminated to Gore (PTFE) RT7100 Glove Barrier Fabric. This barrier fabric is combined to the thermal liner, liner system is individually graded and produced in as many sizes as glove sizes. Wristlet: Nomex 10.5 oz per yard, Double ply, 4” Wristlet. Wristlet sewn to liner, and then sewn separately to the glove shell. Wristlet sewn to liner, and then sewn separately to the glove shell. These Fire Fighting gloves meets the latest NFPA standards - 1971, Standard on Protective Ensemble for Structural Fire Fighting, 2013 Edition. 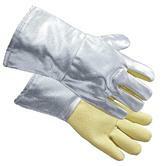 Hot Glove is a heat resistant double layered cotton glove with nitrile grip coating. Achieving Level 2 for contact heat, it can withstand temperatures of up to 250°C providing a high level of protection against heat. The double layer of knitted cotton also offers a degree of comfort, flexibility and dexterity not normally associated with such protection levels. It can be worn on either hand which extends the life of the glove, and is designed to have a generous fit to allow for quick and easy removal when required. Ambidextrous: Can be worn on either hand, extending the life of the gloves. Polyco Hot Heat Resistant Cotton Glove conform to standards: EN388 1.2.3.2., EN407 X2XXXX safety standards. Non slip grip along with Water and oil repellent coating. Made from high performance and high visible fibres, using Techcor® Knitting Technology. Water and oil repellent treatment on both liner and coating. Ideal for use in all mechanical handling applications. Suitable for use in medium level thermal hazards. Level 3 cut Resistant standard. 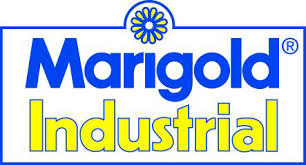 Marigold Puretough P3000 11-423 Glov approved to: BS EN 388:2003 4.3.3.2 and EN 407:2004. safety standards. Touchstone is a knitted glove made with 100% Kevlar® aramid fibre. Kevlar® has an inherent strength protecting against cuts, slashes and abrasion, and is heat retardant making it ideal where burn protection is required. Soft Kevlar fibres keep hands protected whilst allowing wearer dexterity. Breathable to allow comfortable wear over long periods of time. 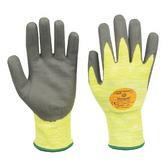 Polyco Touchstone Kevlar Knitted Cut & Heat Resistant Gloves conform to standards: BS EN388 1.3.4.X and EN407 X1XXX. Manufactured from Thermolite fibre providing thermal insulation. Non chaffing and soft construction increasing user comfort. This glove is also ideal to be used as a glove liner. Ideal for working with or around food. The Polyco Tigmaster welding safety gauntlet is a comfortable light duty welding glove. It's fully compliant with European standards EN12477 for Type B welding and EN407 for thermal hazards. The glove is made of high quality sheepskin that is extremely soft and comfortable. This glove also includes a heavy duty leather cuff, providing extra protection to the forearm. Consisting of heavy duty leather, the Tigmaster™ has been specifically designed for Type B welding (Tig welding) and light mechanical handling. Materials: Sheepskin palm (0.8mm) with heavy duty leather cuff (1.0mm). Polyco Tigmaster Sheepskin Leather Welding Gloves conforms to: EN388:2003 2.1.1.1 for Mechanical hazards; EN12477 for Type B welding and EN407 for thermal hazards. Manufactured from the toughest leather, very resistant material increasing product life. 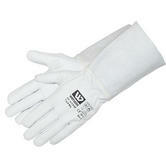 Protects hands from intense heats during welding or other tasks. Easy slip on and off design, useful in the case of any accidents or emergencies. Conforms to EN388 & EN407 Safety Standards. A professional blue welder’s gauntlet made of premium split leather with 1.00mm of minimum thickness. Soft and comfortable welding glove in goat leather with ox split leather cuff. Suitable for welding tasks when it's required good dexterity. Suitable for welding that requires finger sensitivity. A-grade welding glove, extended cuff made of split leather - Tig, Mig and Argon welding glove. Wenaas Odin 6-6490 Tig & Mig Gauntlet Glove conforms to: EN 420:2003 EN12477 B EN 388:2003 2121 EN 407:2001 Cat.2 safety standards. Manufactured with a leather hide palm. Heat resistant making it ideal when welding. The lining on the inside is 100% wool making these gloves very comfortable. Glove Leather Hide Welder Glove - Aluminised Terk400 conforms to: EN388 4.1.4.3 Safety Standards. These are lightweight black, fire fighting gloves, used typically for road traffic accidents. The sophisticated design of the all-round model Jupiter III makes it the best fire brigade glove of its kind. The 8012 Jupiter III - E gloves are equipped with a permanently fixed (ESKA patent) waterproof, breathable Gore-Tex membrane & knit Kevlar lining enhanced with silver fibre. Coated Kevlar on the palm, fingers & the whole thumb guarantees excellent protection against heat & flames, great piercing & cut resistance as well as maximum wear resistance. The interior lining is comfortable and anti-bacterial reducing odour build up. The key parts of the glove (palm, fingertips, thumbs) are reinforced with silicon/carbon kevlar (cut resistant). Exceptionally secure fit, obtained through the two-strap fastening system. Eska 8012 Jupiter III-E Fire Fighters Gloves conform to: EN 659: 2003 & EN 659: 2003 + A1: 2008 Safety Standard. Manufactured using 100% Kevlar improving the overall durability of the glove. The ambidextrous design allows both gloves to be worn on either hand. Designed with a cotton liner for maximum comfort during wear. Ideal for working with hot and sharp parts, suitable for welding. Honeywell Kevlar Plus Hot Mill - 62/8434 Heat Resistant Glove conforms to: EN 420 EN 388 : 254X EN 407 : 43432X, Resistant to 350°C non continuous contact. Manufactured with an outer split leather and a 100% cotton lining. 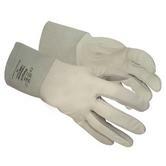 Heat resistant making these gloves ideal for welding and other jobs involving fire. 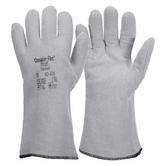 14" glove provides sufficient protection during hazardous tasks. Click 2000 Full Lined Hands & Cuffs Heat Resistant Leather Welder Gauntlet Glove conforms to EN388 3.2.3.3 & EN407:2004 4.2.3.X.4.X Safety Standards. Manufactured to be a long lasting, this heat resistant gauntlet glove is high quality. Provides superior heat resistance against temperatures up to 200°C/400°F. Gives the user exceptional grip in all weather conditions, whilst also maintaining dexterity. Conforms to EN388:2003 & EN407:2004. The shell materials reflect radiant heat while the carbon inner lining helps reduce heat conduction. The Para-aramid palms offer excellent abrasion resistance. Durable and comfortable welding gloves for professionals. Welding gloves made of cow split leather for high heat resistance. High heat welding STEERSOtuff 10-2900 gloves conforms to: EN 12477 (09.2005) TYPE A, EN 388 4.2.3.3 and EN 407 4.2.3.X.4.X hand protection standards. Heat-resistant gloves help provide critical thermal protection in where workers are exposed to intense heat and even flames. Our range of welding gloves and gauntlets includes leading glove manufacturers such as Ansell, Granberg, Polyco and Wenaas. With names like Tig master, Weldmaster, Kilnmaster, our gloves are designed for foundry and welding applications. Wenaas welding gloves are favoured across the North Sea, not just as leather welding gloves / grinding gloves, but also for heavy duty use. The Polyco Tigmaster and Weldmaster gloves also feature heat resistant leathers (in goatskin or sheepskin for greater dexterity). The Polyco Kilnmaster Foundry Gauntlet is used in foundries and has a shiny metallic outer to reflect intense heat away from your hand or forearm. 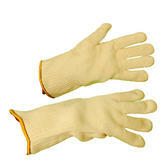 We also offer heat resistant gloves (eg the Ansell Kevlar knitted yellow cut resistant gloves). 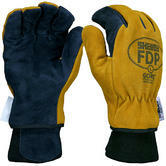 Our Shelby firefighting gloves are used by professional fire fighters in the USA and worldwide. The range includes structural fire fighting gloves, extracation gloves and fire rescue gloves.